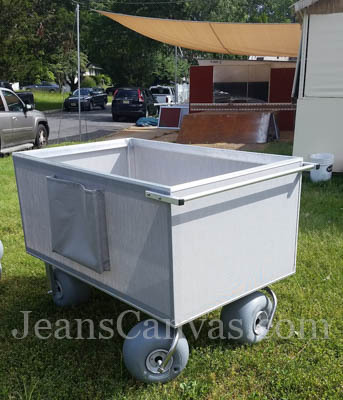 We provide strong and sturdy Residential Custom Carts at Jean’s Canvas Products. We only use the strongest materials to create the best Carts for You! Wheeleez Tires are held with stainless steel casters and all of our frames are made with Aerospace Military Grade aluminum in our shop. Weight capacity ranges between 300 and 450 pounds depending on the wheel size. These great Residential Custom Carts are perfect for any and all of your person needs at home, beach house, condo and the beach. They are easy to transport and they move with ease on all surfaces. Our Certified metal workers use 1/8” diamond plated aluminum for cart construction, but upon request 1/2” Azack plastic can be used for the flooring and walls. These Custom Residential Beach Carts are usually built slightly narrower and shorter than our standard Custom Beach Carts. Here are Jean’s Canvas Products we believe in excellent customer service. We answer all emails and you get a live person to speak with when You phone. No menu’s and prerecorded messages. Reach out to Jean’s Canvas Products today and get the personal touch of excellence in our service and our Custom Carts. We ship everywhere!